At the 21st IAEA Fusion Energy Conference in Chengdu, China, the lead author of a paper that demonstrates how one of the primary physics goals of ITER might be more safely realised was awarded the inaugural Nuclear Fusion Award, which is presented by the IAEA. 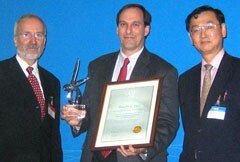 Winner of the inaugural Nuclear Fusion Award, Dr Timothy C. Luce (General Atomics), is presented with his award by Professor Werner Burkart (Deputy Director General, International Atomic Energy Agency) and Dr Mitsuru Kikuchi (Chairman of the Board of Editors, Nuclear Fusion and Director Division of Advanced Plasma Research, Japan Atomic Energy Agency) at the 21st IAEA fusion conference. T.C. Luce et al. were awarded the prestigious prize for their paper 'Stationary high-performance discharges in the DIII-D tokamak' (Nuclear Fusion 43 (5), pp. 321-329). The paper outlines a tokamak scenario that can maintain high fusion performance at reduced plasma current (compared with the conventional tokamak operational scenario), thereby lessening the potential for structural damage in the event of a plasma disruption. Projections in the paper show that realization of this scenario in ITER could lead to fusion performance at or above an energy gain of 10 for longer duration with reduced risk.